This morning, Sega released a new trailer for Sonic Free Riders, ahead of the game’s launch next month alongside Microsoft’s Kinect peripheral. This trailer focuses on the array of in-game weapons available to players. Most will be useful but a good few are bizarre. Included in both categories: the Soda Rocket, prominently featured in the video. It looks like players can dash toward the top of the pack while ramming anyone who gets in the way. Check out the video below. 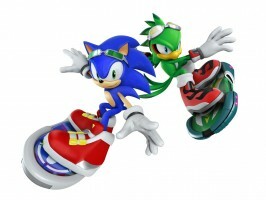 We’re now about a week to Kinect’s launch day in North America, so the media blitz for Sonic Free Riders, a Kinect launch title, should be in the cards. TSSZ News will bring you more assets and information related to the game once made available. Shenmue III To Be Revealed At E3?